Top 25 uses for frankincense essential oil. There are countless uses for Frankincense essential oil and what works for one may not work for all but here are 25 great uses. Frankincense was valued more than gold during ancient times, and only those with great wealth and abundance possessed it. It is considered a holy anointing oil in the Middle East and has been documented dating back to thousands and thousands of years ago. Frankincense is very delicate to extract, and the process takes almost half a lifetime for most people. A Frankincense tree cannot even be tapped into to extract the essential oil until the tree is 40 years old and dead. There are countless uses for Frankincense essential oil. What may work for one person, may not work for the next. We are all different and our bodies are forever evolving, just as essential oils are changing as they are from nature. These uses are intended to be a guide for your experimentation. Apply on aging skin by mixing with lavender and coconut oil morning and night. Apply a few drops on cuts and scars to help heal and reduce appearance. Help soothe children by applying with coconut oil onto their feet around bedtime. Ease back discomfort by applying directly on the spine. Diffuse to uplift mood and help combat low emotions. Apply on temples and wrists to relieve stress. Apply on neck and throat to soothe irritations. Apply a few drops on itchy, dry skin to soothe irritations. Massage into sore joints to ease discomfort. Good for your skin. Add one drop to your moisturizing cream or just add 1 drop directly to your skin. Massage one drop directly on sunspots. Body rub – combine coconut oil, lavender, and frankincense. Can add Melrose as well if bad skin issues. If under the weather, take an Epsom salt bath with frankincense and lavender then rub the body down with frankincense. This is good for building up immunity. Great addition to prayer time. Great to massage into the skin after strenuous activity. Promotes healthy and proper cellular function. Supports restful sleep – diffuse frankincense and lavender together. You can dilute a drop of frankincense and apply to the bottom of baby’s feet on the vita flex points to support a healthy immune system. Rub a drop on your forehead and back of neck to uplift your spirits. A drop on the crown of the head can relieve headaches. Use it neat on age spots to lighten them. Diffuse it to calm down little ones. Young Living has their own Frankincense and Myrrh tree farm in Oman in the middle east. Its pure oil is unlike any other I’ve experienced. What I love about frankincense, in particular, is the scent brings back memories for so many. Some have a strong aversion or liking to the oil due to childhood memories of church. My daughter loves the smell because it reminds her of our basement for some reason. But because of that, it is comforting for her and when she is not feeling well or anxious, she requests this oil. 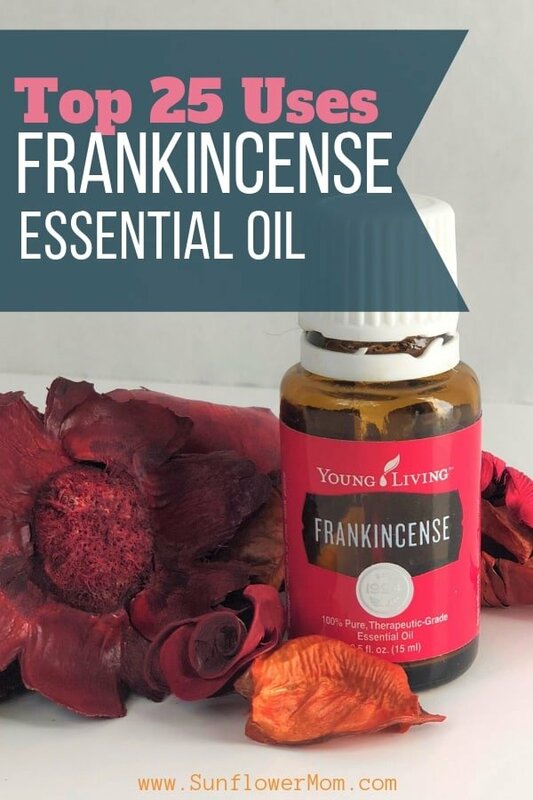 You can get a bottle of frankincense essential oil directly from Young Living here. The best value by far is to become a wholesale member. But if you only want one bottle of this little gem, you can get that too!